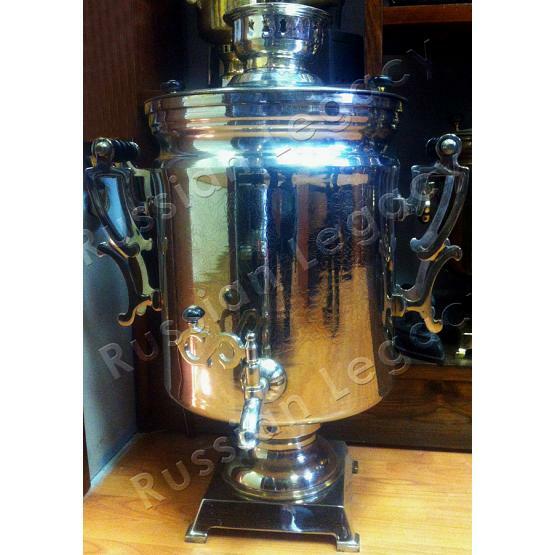 Authentic nickel plated electric samovar produced in limited quantities at the "Shtamp" factory in Tula, Russia. Engraving features an episode from "The Tale of Cross-eyed Lefty from Tula and the Steel Flea". 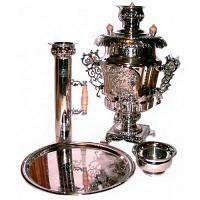 Such samovars were used in Soviet cafes and canteens where you could buy a cup of tea for just a penny. This item has become very rare nowadays. Volume: 190 U.S. cups (45 liters). Power: electric (5 kW, 220/110 V). Takes about 50 minutes to boil on 220 V. Width from handle to handle: 22.8" (58 cm). Height: 32.3" (82 cm). Weight: 55 lbs (25 kg). Production: 1960-70s. 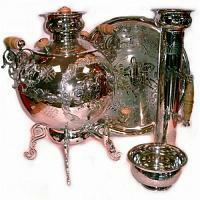 Please contact us for a shipping quote before placing an order.